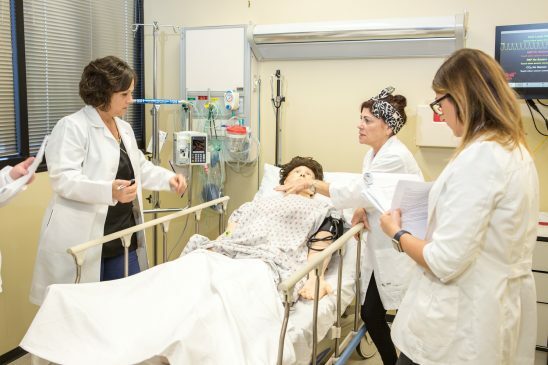 The nine recent graduates from the University of Central Florida College of Nursing Healthcare Simulation program are the first in the state fully trained to lead in the high demand field. “Health care simulation is the perfect blend of educational theory, active practice, innovative technology and self-reflection. I firmly believe this is the future of all hospital education,” said Karenna Thatcher, ’17MSN, RN, nurse residency program coordinator at Florida Hospital. And before working in a real-life clinical setting. In total, nine students completed the innovative program last month – two earning a master’s degree in nursing and healthcare simulation and seven earning a certificate in healthcare simulation. Through the comprehensive program, students develop skills for leading simulation programs in education, team training and quality improvement in health care. The second cohort will graduate in December. The college accepts applications to the master’s track twice a year and once a year for the certificate track. Due to Hurricane Irma, the application deadline for the master’s track has been extended through Oct. 15 with classes commencing spring 2018.